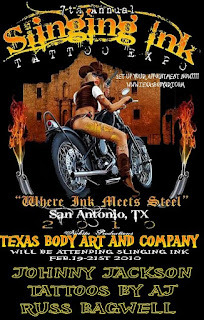 This years Slinging Ink will be held in SanAntonio on Feb.19-21st. Johnny Jackson ,AJ,Russ Bagwell will be sharing booths there and are now accepting appointments for the weekend. Mizuz Inkaholik will be there as well so come see her and get your photo taken with her. 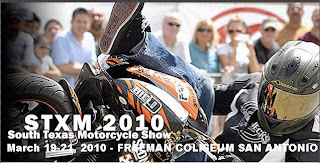 HTML clipboardCOME CHECK OUT THE BIGGEST MOTORCYCLE, MUSIC, MODELS AND MAYHEIM EVENT OF THE YEAR. THE 6TH ANNUAL SOUTH TEXAS MOTORCYCLE BIKE SHOW @ JOE FREEMAN COLISEUM MARCH 20-22. THERE WILL BE LIVE REMOTES FROOM 99.5 KISS, KZEP 104.5 CLASSIC ROCK, AND THE BEAT 98.5. SAN ANTONIO'S BEST ACTS SHARE THE STAGE IN 3 ACTION PACKED DAYS. THERE WILL BE LIVE BANDS, EXTREME STREET SCENE, $10,000.00 STUNT COMPETITION, SWAP MEET, AND OVER 250 VENDORS, AND MUCH MUCH MORE. 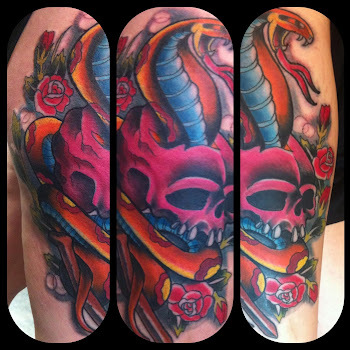 WE WELCOME IN OUR NEWEST ARTIST TO THE TEAM WHO HAS HAD A REPUTATION IN HOUSTON FOR OVER 12 YEARS AS A GREAT TATTOO ARTIST. ONCE A MONTH ON THE 3rd WEEKEND OF EVERY MONTH SEAN OZZ WILL BE AT THE SHOP. HE WILL BE TATTOOING BY APPOINTMENT ONLY SO MAKE SURE TO SET UP SOMETHING NOW FOR HIM TO DO HIS BEAUTIFUL WORK ON YOU. shop and always try to show him a warm welcome when he is here. You can meet him and/or get tattooed by him at the studio. If your not familiar with him check it out at these sites. ALSO FOR A LIMITED TIME ONLY!!!!!!! 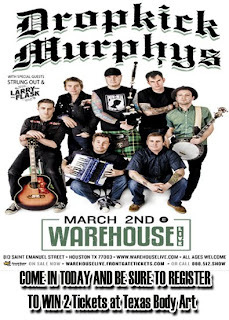 BE SURE TO SWING BY TEXAS BODY ART TO REGISTER FOR FREE TICKETS TO SEE THE DROPKICK MURPHS COMING TO WAREHOUSE LIVE. There is a box inside the studio and while your getting your new tattoo you can register to win. Winner gets 2 tickets to the show on March 2, 2010. Thanks very much for all the support. Make this the year to get your new INK! Texas Body Art is now on twitter and Facebook so feel free to add them today and stay on top of the latest news.